The Mercure Exeter Southgate Hotel is a contemporary 4-star hotel and supremely located in the heart of Exeter. Within walking distance to all the main attractions and the city centre, the Exeter Southgate Hotel is perfect for a city break. Whether you are coming for business or for leisure, the Southgate Hotel will cater for you with meeting and conference rooms. 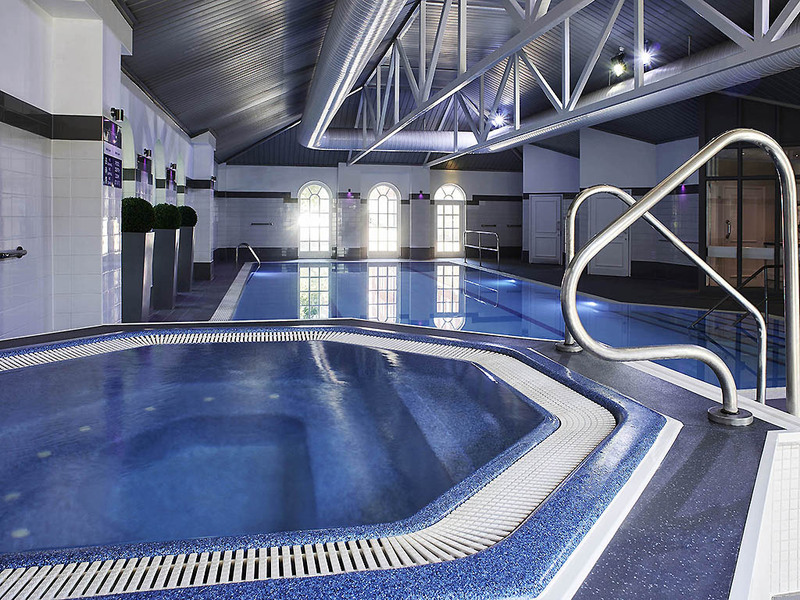 Enjoy yourself at the Spa with heated pool, sauna and fitness room when you visit Exeter with us. Parking charged at 12GBP per day. The hotel neighbours the cathedral, the shopping areas of Princesshay, Bedford Square and the historic quay. The location is perfectly situated for short breaks and is great for golfers as it is close to an 18-hole golf course. Open 24 hours a day and seven days a week, the hotel is easily accessible and caters to young children and disabled guests. Those attending for business purposes will also benefit from the hotel's meeting facilities, welcoming up to 120 people. The hotel is a stones throw away from the Catherdral, Quay & Shops. Nearby is Crealy Adventure Park 2m; Go Ape 5m; Beaches 12m; Dartmoor 15m; Torquay 20m; Paignton Zoo 25m; Dartmoor Zoo 40m; Plymouth Marine Aquarium 35m; Cornwall 40m; Eden Project 60m. The hotel's 156 bedrooms offer guests a range of accommodation options including classic, privilege, suite, interconnecting and 7 accessible rooms. All bedrooms are non-smoking and have WIFI access, room service & flat-screen TV. Every bedroom is in line with 4-star standards but our rooms also offer particularly inspiring views over the city, including Exeter Cathedral, historic Southernhay and distant glimpses of the Devon countryside. Our chef Mr Tom Porter welcomes you in our Gate House Restaurant. Guests can enjoy contemporary British cuisine including locally sourced meat and fresh seafood. The lounge bar and Terrace are open all day, for a drink or for a light meal. 24 hour room service is also available. Average - stayed in better for £102 a night! Room not as described on web and not that special for price paid. Reception staff very professional, friendly and helpful. Rooms well maintained and clean. I was due to give a lecture at the South West of England Epilepsy Forum on 4/04/2019. UCB Pharma Ltd had booked my room. However, on arrival, the receptionist asked me if I wanted breakfast. I was shocked that UCB Pharma had not booked breakfast for me. Furthermore, I was told the room had been booked but not paid for; I could not believe it!/ Disappointed and annoyed, I spent the whole evening thinking about it. However, when I checked out on 4/04/2019, the new receptionist KNEW WHAT WAS GOING ONknew and confirmed that UCB Pharma had paid for everything (including breakfast!). We visit regularly & so was disappointed not to feel welcomed in our room with usual signed card & small bottle of non alcoholic drink . Especially that they made NO mention of my husbands birthday when I had emailed them to inform them it was a special visit. Mentioned all this on check out & they waived the parking fee which was a nice gesture. Still felt let down however as no special welcome any more it seems. Excellent service. Helpful staff. Comfortable room. Would recommend to a friend. The overall stay was pleasant and the staff was welcoming, however we had to cut our stay short as there was an issue with the fire alarm that kept going on. Well looked after in a busy hotel. The room was clean and of a good standard.The breakfast was ok but seemed to have a rather slow response to replenishing what was on offer. Relatively well organised though there were a couple of annoyances. One room wasn't ready on arrival and even after it had been cleaned there were still left over drinks and bottles in the hallway from the night before. The smoke alarms were also going off repeatedly for 30 mins. Very good and for the price I overlooked a few small shortcomings. Great value. Any issues were due to shortage of staff - this showed at breakfast time. I will definitely stay there again. I was also impressed that when I called they were very tenacious and got me book up there and then - most other hotels are apathetic and lose business as a result. It was most enjoyable, relaxing and comfortable. The bedroom and bathroom were excellent, the bed extremely soft but firm. The nights were quiet and calm. I did notice you have cut down on the complementary bathroom items which is a Shame! On arrival I was pleased to see that there was ample parking. Check in was not so good, with a sign welcoming Priority Customers, to an unmanned lower desk, but with the two people on the desk dealing with non Priority guests who were queuing. The room was a privilege room with no working extractor in the bathroom, which remained non functional during our stay. On Saturday the in gate was open and people took advantage of this to come and go through the gate nearly causing accidents as arriving guests could not see them until having turned into the path of the gate. On Saturday night a function took up the entire foyer making it nearly impossible to move between the entrance and rooms. This is unacceptable. If there is nowhere for a reception then functions should not take place. Certainly the foyer cannot become a virtual no go area. On Sunday the number of guests at breakfast meant that in order to get a coffee or tea the waiters had to be chased down. Not something one should have to do. The hotel was largely clean and tidy, though with worn stair carpets, but is only a ten minute walk from the river and cathedral area restaurants and shops making it a good spot for a visit. Though whether the other Mercure in the city would have been better I do not know. Breakfast was ordinary and we otherwise ate out, which judging by Saturday was a wise choice. Good service and good facilities just one or two things away from a 10. Good service in the restaurant for breakfast, cheerfull staff at the pool. Both Key cards were not programmed for room in arrival envelope, had to come back to reception. Room 187 needs a bit of care, TV in bed area does not work (not tuned). Air conditioning does not work, reported but not fixed or advised of fix not possible on 2 days of stay. Toilet roll holder loose. Bedside tables need replacing. Sofa bed not fit to sleep on - even for a kid. Restaurant and bar service very poor. Only three choices on restaurant menu - same menu each night. Tea and coffee not replaced when used in room. Room size inadequate for wheelchair user. Only stayed for 1 night, it was a lovely comfortable, clean hotel. Nice gym, excellent breakfast and staff, our only criticism.....we had a door in our room, connecting to the room next door, obviously it was locked as we didn’t need it, but we could hear the chap next door on his phone very clearly and we could even hear the person he was talking to on the other end. Luckily we weren’t disturbed by any noise later on in the evening.